Originally called Bald-headed Hill, the 303 acre Constitution Hill reserve got its current name in 1788. A Lanesboro delegate to the convention in Boston weighing state ratification of the proposed new US Constitution arranged for a bonfire to be lit atop the hill if Massachusetts approved it. The state did, and the signal could be seen for miles. The moderate 60-90 minute Constitution Hill Trail lets hikers recall that historic moment. The Field Trail offers and easy walk and views of Mt. Greylock. 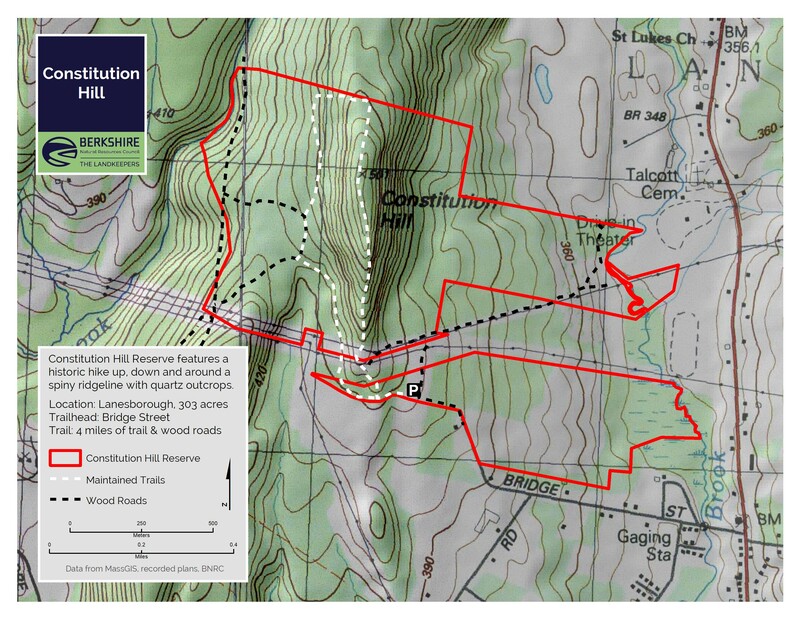 ATTENTION TRAIL USERS: Timber harvesting will take place from late January 2019 — 2020. There will be logging machinery on the lower (west) trail and near the parking area. Equipment operators will be cautious of hikers. Please park in the designated areas. Trails will remain open, but PLEASE USE CAUTION. Contact Nicole Pyser at 413-499-0596 or nypser@bnrc.org with any questions. From Pittsfield: Take Route 7 north into Lanesborough. Just past the Lanesborough Police Station turn left onto Bridge Street. If you pass The Old Forge you have just missed it. Follow Bridge Street to the end, past the BNRC sign, to the large parking area with a kiosk. From Lenox/Lee: Take Route 20 north into Pittsfield. In Pittsfield, continue past the BNRC offices and hop on Route 7 (First Street, but North Street will work too). Take Route 7 north into Lanesborough. Just past the Lanesborough Police Station turn left onto Bridge Street. If you pass The Old Forge you have just missed it. Follow Bridge Street to the end, past the BNRC sign, to the large parking area with a kiosk. From North Adams: Get on Route 8 heading south and drive to Cheshire. In Cheshire, just past the fire station and just before Cheshire Reservoir, turn right onto Lanesboro/Old Cheshire Road. After 4 miles, turn right onto Prospect Street. At the bottom of the hill turn right onto Route 7, and immediately left onto Bridge Street. Follow Bridge Street to the end, past the BNRC sign, to the large parking area with a kiosk. A loop trail of about 2.5 miles takes visitors past the Constitution Oak tree and a nearby large quartz rock. Beyond the summit, the trail turns westward past an old stonewall before bringing hikers back on what eventually becomes a woods road whose surface was once hardened by chunks of slag glass, which are still visible. Slag glass is a byproduct of iron production that was used as fill on old roads. In 1788, a Lanesboro farmer named Jonathan Smith was chosen to represent his town at the convention in Boston that would decide whether Massachusetts should ratify the proposed new US Constitution. At the convention he made a persuasive argument in favor of it as a way to prevent outbreaks of violence like Shays’ Rebellion in Western Massachusetts. The bonfire he had organized atop “Bald Headed Hill” alerted residents of Lanesboro and surrounding towns that his view had prevailed and Massachusetts had ratified the Constitution. The hill is no longer bald, and was renamed “Constitution Hill” by Smith. The forest has long since reclaimed the landscape, though there are winter views from the ridge after leaves have fallen. A plaque marks the bonfire site, near an oak that was planted in 1921 to replace an oak that was the solitary sentinel on the hill in Smith’s day. Near the trailhead and its two parking areas is a reclaimed orchard and the site of the home of a 19th century humorist, Josh Billings. He is now memorialized by Berkshire County’s annual Josh Billings RunAground triathlon. He then delivered the speech that arguably helped decide the fate of our nation. At the time, the common man regarded the proposed Constitution with some suspicion. It had been drafted by lawyers, and was approved by men of wealth and property – the same class of men who seemed bent on taking debt-ridden farmers to court and throwing them into debtors’ prison. Shays’ Rebellion (1786-87) in South Berkshire was the fruit of this class warfare and now before the doubting convention in Boston lay a federal Constitution that some thought would memorialize the imbalance. Four states had ratified the Constitution, but the critical states of New York and Virginia were waiting to see what Massachusetts would do. Swayed by Smith’s words, the Massachusetts convention ratified the Constitution by a vote of 187-168. Other states quickly followed suit, and the Constitution took effect in March 1789. Before departing for Boston, Smith had arranged for a bonfire to be lit atop Bald Headed Hill on the day Massachusetts ratified the Constitution. 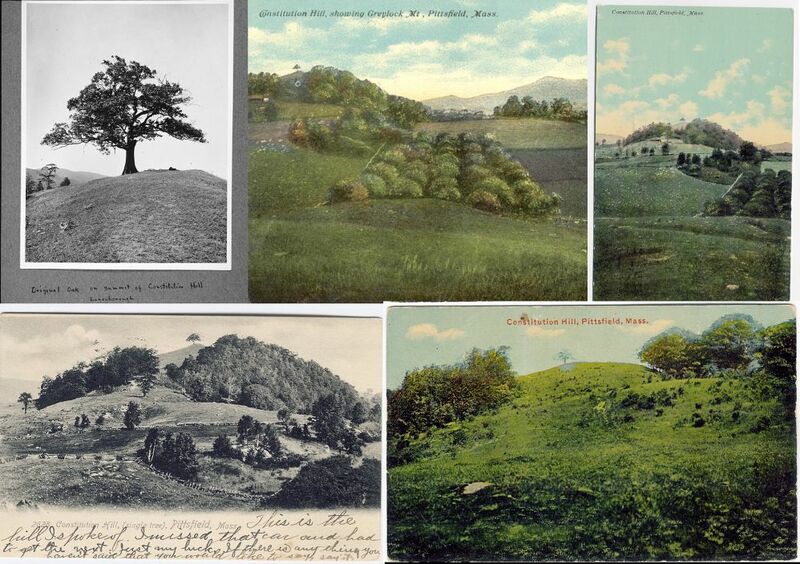 In a time when there was hardly a woodlot to obstruct one’s view, Bald Headed Hill, with its “crown shaven like a monk’s with the exception of a solitary stately tree resting on its extreme summit,” was a landmark for miles around. The bonfire spread the word, and the town renamed the hill that year to honor the Constitution and Smith’s role in its passage. In 1903, the historic “solitary, stately” oak tree at the summit suffered a lightning strike. It survived until 1920, when vandals built a fire at its base. The town replaced it with a red oak sapling, which stands today in the forest at the top of the hill. The forests of Constitution Hill have grown up around the old oaks and the landscape today is far different from the one which Smith and Billings knew. 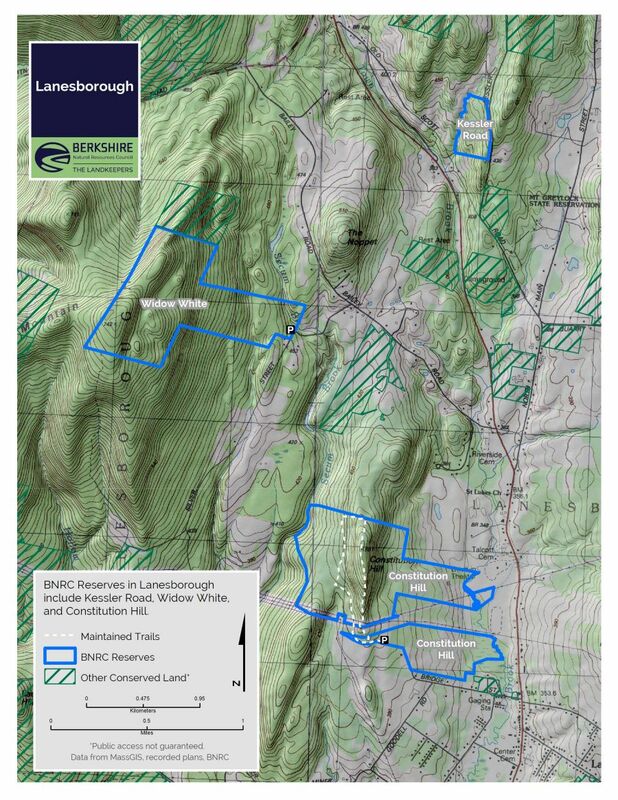 The return of the forests has ushered in the recovery of many of the characteristic wildlife we identify with the Berkshires including black bear and moose. However, as more farms give way to houses declining early successional habitat threatens many wildlife species dependent on open fields, shrublands or the dense thickets of young forests for nesting, breeding, and feeding sites have declined in number. Without the protective cover of dense grass and thickets, birds such as the Eastern bluebird (Sialia sialis), olive sided flycatcher (Contopus cooperi) and American woodcock (Scolopax minor), are unable to nest safely hidden from predators. Other animals, like the New England cottontail rabbit (Sylvilagus transitionalis) as well as various insects and other invertebrates depend on tender nutrient rich plant material found growing these spaces. Further up the food chain a suite of predatory species including snakes, foxes, owls, and others rely on these open areas for their abundant prey. In 2006 BNRC, with the help of the Massachusetts Department of Fisheries and Wildlife’s Landowner Incentive Program, began work to reclaim parts of the abandoned orchards and fields that were part of Constitution Hill in order to maintain the pieces of the puzzle that various wildlife need to survive. In conjunction with this effort we will be managing the fields that can produce agricultural products while providing the same valuable early-succesional habitat. The forested areas will be managed for sustainable timber management that goes beyond sustained yield to simulate natural disturbances, retaining large legacy trees and standing snags for wildlife that depend on characteristics of “old-growth” forested habitat. With the declining available land base and increased population pressures our communities must find creative and sustainable ways of supporting our needs with the land base and providing for the critters we share this place with. As visitors explore this property they can consider the past landscape, the present and what our landscape will look like in the future. 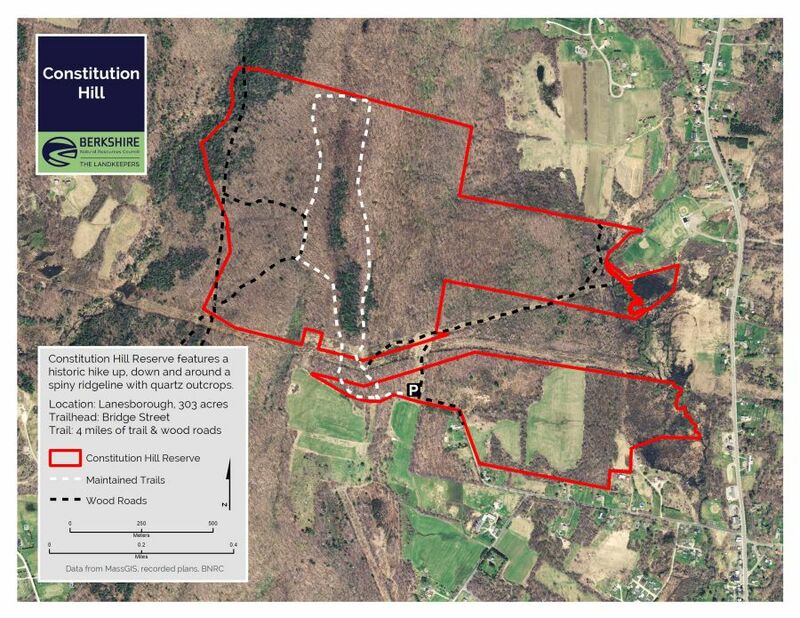 Constitution Hill was gifted to the Berkshire Natural Resources Council in 1998 by N. Robert Thieriot to manage for multiple uses. Josh Billings, the local humorist whose fame is kept alive by the annual Josh Billings RunAground Triathlon, lived on this property. Walkers today will enjoy the 20-30 minute climb from the trailhead to the spine of the hill and the summit. The original Constitution Oak probably stood beside the large white quartz rock at the top. After descending from the ridgeline, return on the blue-blazed trail, noting the slag glass used to firm the road. Round trip should take 60-90 minutes depending on your pace. Deer are abundant on Constitution Hill, whose diverse habitats are home to white and yellow birches and other hardwoods, as well as Dutchman’s breeches. In 2006, the Berkshire Natural Resources Council, with the help of the Massachusetts Department of Fisheries and Wildlife’s Landowner Incentive Program, began reclaiming parts of the property’s abandoned orchards and fields to create conditions that various wildlife need. Forested areas will be cut to simulate natural disturbances, retaining large mature trees and standing snags for wildlife that depend on such “old growth” forested habitat characteristics.